When it comes to pushing out software updates Nokia usually does it quickly and within the announced timeframe. Back in October, though, the company promised that the Nokia 8 and Nokia 8 Sirocco would receive the Android 9 Pie update in November. This hasn't happened because of issues, according to HMD Global, but today we may have found out another reason why. According to one industry source, the Android 9 Pie updates for the Nokia 5, Nokia 6, and Nokia 8 are finalized and have been for quite some time – the Nokia 8 was recently spotted running Android Pie. But rather surprisingly, it's claimed that the company is withholding certain updates in the hope of boosting sales of newer devices. While the Nokia 5 and Nokia 6 models are expected to receive the updates sometime this month or in early January – still pretty early considering the models are almost two years old – users of the original Nokia 8 may have to wait quite a while longer. Despite the promise of receiving the update last month, it’s claimed that HMD Global’s Chief Product Officer, Juho Sarvikas, took the decision in early November (when the update was ready) to push back its release. The reason behind this being that he believes a delay will push consumers to buy the newer Nokia 8.1 – consumers tend to prefer buying smartphones with the newest software. According to the source, the original Nokia 8 will now receive its Android Pie update on the last day of December or possibly even early January, essentially two months later than promised if true. An expected one though. Would phone manufacturers neglect older phones to force people to buy the newer ones? They would NEVER! If this is true, this is a pretty duck move of them. Sales sales sales. What matters. So much for Android One. If this is true, this is NOT COOL, HMD. This is a deceptive practice, and you should halt it IMMEDIATELY and update the smartphones that are ready to be updated. Lmao I could only imagine if this was Apple. Then again, planned obsolescence through updates that cripple the phone, initially not being transparent about battery throttling, the famous “you’re holding it wrong” statement from Apple and some other things are just as bad, if not worse, than this. There is a good chance that this is just a conspiracy theory, though. I hope that’s all it is. Googling it reveals that - officially they are late with the update due to unresolved issues. Until Juho Sarvikas actually admits it or someone shows real evidence to back this new "revelation" - it's just a slanderous opinion. IMO. Exactly. I searched around the web and I found the same info you did. And I hope that holds true. Would be a shame otherwise. But it is slanderous without any solid proof. That source is the same source that first revealed the Nokia 9's delay (and a number of other pieces of info). I only use sources that are credible and I definitely do not write about "conspiracy theories." I agree. No solid proof that this is happening. Just speculation. HMD themselves said that the Nokia 8 Pie update was delayed due to issues with the update on the phone, and if you read the thread in the Twitter link, someone who was at the 8.1 launch said it was a Google that brought up concerns to HMD about the update that HMD needed to address before releasing it. There's very rarely "proof" with leaked information. You either choose to trust sources or not. Let's face it, there was no real proof about the Nokia 9's delay until this week when HMD actually admitted to it (that could have easily been interpreted as a conspiracy theory). Leaked information is provided by industry sources and we either believe them or we don't. This guy has proven himself to be credible more than once which is why I've written this piece. If I had any reason to believe it's a lie it would not be on the site. Considering HMD actually promised the update for the Nokia 8 would arrive in November, the normal thing to do would have been to address the situation at the Nokia 8.1's launch event and explain that there have been some unexpected issues if that is actually the case. So if there is rarely "proof" why post it as "reportedly"? This guy clearly isn't a source in Nokia, he's an outsider. So wouldn't the correct term be " rumored"? You're choosing to believe this guy with no actual proof, just slander from him. That's not good journalism, IMO. It's looks like you're literally choosing to run with this story for cliques, since there is no actual proof, which you even admit. HMD literally said that the update was delayed due to issues, and that was BEFORE the release of the 8.1. That's from a source inside of the company that's as close to the matter as it gets. I can provide the link where they say it if you need it. It seems we are in complete agreement on this MG. And to show what bad journalism can do just look at the responses it generated with some of the readers here assuming this was proven fact. Juho Sarvikas' name is even thrown in the mud here. What Joshua wrote in the second last paragraph: "The reason behind this being that he believes a delay will force consumers to buy the newer Nokia 8.1" Even his "source" didn't make such a bold statement. We absolutely are. I totally agree with your point on what bad journalism can do as well. People are assuming this inflammatory statement is true, without seeing any hard evidence to back such a claim. And the fact that he added statements that the source didn’t even make backs up what we believe is poor journalism, especially considering the inflammatory nature of the statements made. I am not accusing HMD of anything. I am reporting on what one historically accurate industry source has stated. As mentioned above, this guy revealed the Nokia 9 was delayed way back in September and confirmed that the leaked live images were real (something backed up by @OnLeaks later on with his renders.) 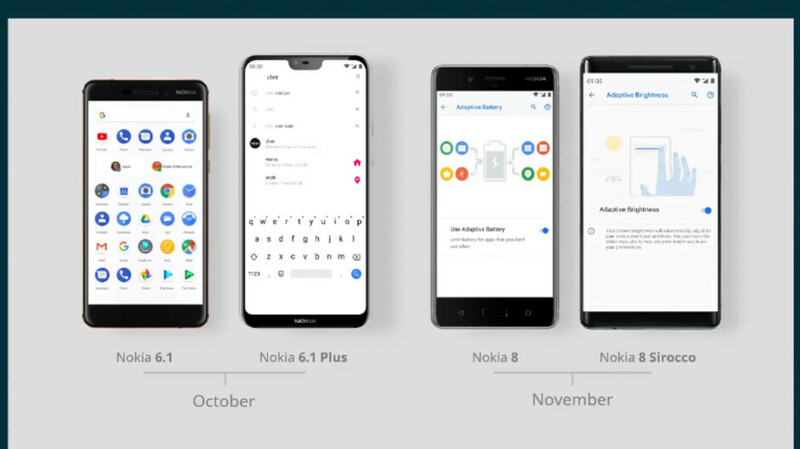 In October he also stated the Nokia X7 would be released as the Nokia 8.1 internationally rather than as the Nokia 7.1 Plus – confirmed as true this week. The source also revealed there were Nokia wireless chargers in the works. These haven't been announced but images were leaked by the WP Consortium. No "proof" for any of these claims, but all info obtained by his sources within HMD and all accurate so far. So forgive me for believing him. What he has stated is not backed by any proof, and even you have stated there is no proof earlier. Confirming phone names and other devices being released by vendors is different from the assumption that HMD isn’t releasing an update due to wanting to garner sales for another device. When such an accusation that could tarnish the reputation of the company is levied AFTER THE FACT that HMD has gone on record saying that the update hasn’t been released due to issues, one MUST supply solid evidence to back such a claim. It’s poor journalism (IMO) to run with this story as if it is fact, when ZERO evidence has been provided about the subject, considering the volatile nature of the comments made by said individual. It would have been proper journalism (IMO) to run worth the story as a “rumor”, since there is no solid evidence backing such a claim. So forgive me if I believe this is just for clicks. To end this here (as I feel we could be debating about this all day hahaha) I would just like to say thanks for all of this feedback. Although I am in disagreement with you guys on certain points I do get where you are coming from and, at the end of the day, any feedback (positive or negative) is welcome. It will only make me better at what I do. I have changed the title so that it's clear this is a rumor to avoid any possible misinterpretations (some of our readers just read titles and not the full article). I would have done this earlier but I didn't have my computer at hand. Oh and from a consumer point of view, I hope the devices get updated soon. Thank you. This right here shows integrity from you, and I truly appreciate that. (Yeah, we would have been debating all day and all night lmao). I hope it gets updated soon as well. Cheers, Joshua. I had my share of quarrels with meanest, but I agree with most of his statements here. As a journalist you should almost always confirm your sources claims. I'm going to assume that making a living as a writer on PA is somewhat difficult. To create an interesting and compelling article that makes us users want to comment...it must be a daunting task. I agree. But as a writer for a tech site or anywhere similar, journalistic integrity should be paramount. You think Samsung doesn't do it? They all do it on some level. I mean, think about companies that make very few models who are slow with uodstes. Samsujg has lots of models so updates being slower would be understandable. But a company that makes 10 phones, should be able to keep them up to date in a reasonable amount of time. Iys always better to buy new hardware with the new OS vs uograding. Bill Gates has said this many times. Because the hardware is built around the OS and this the device will be better than one that only upgrades, because it won't get all of the latest benefits. It’s not the right thing to do, no matter who does. If the device is eligible for the update, it should be updated. “They all do it” There are at least 2 companies that don’t do it, so your statement is incorrect. PA where is the proof? Is it because Nokia is on the rise and they are selling very good? No proof, it did not happen!